Starting out from the idea that rectification means, as I’ve said before, looking for new solutions to old problems, rectifying many negative tendencies that had been developing; that rectification implies making more accurate use of the system which, as we said at the enterprises meeting, was a horse, a lame nag with may sores that we were treating with mercurochrome and prescribing medicines for, putting splints on one leg, in short, fixing up the nag, the horse. I said that the thing to do now was to go on using that horse, knowing its bad habits, the perils of that horse, how it kicked and bucked, and try to lead it on our path and not go wherever it wishes to take us. I’ve said, let us take up the reins! These are very serious, complicated matters and here we can’t afford to take shots in the dark, and there’s no place for adventure of any kind. The experience of so many years that quite a few of us have had the privilege of accumulating through a revolutionary process is worth something. And that’s why we say now, we cannot continue fulfilling the plan simply in terms of monetary value! We must also fulfill it in terms of goods produced. We demand this categorically, and anyone who does otherwise must be quickly replaced, because there’s no other choice! We maintain that all projects must be started and finished quickly so that there is never a repeat of what happened to us on account of the nag’s bad habits: that business of doing the earthmoving and putting up a few foundations because that was worth a lot and then not finishing the building because that was worth little; that tendency to say, “I fulfilled my plan as to value but I didn’t finish a single building,” which made us waste hundred of millions, billions, and we never finished anything. It took fourteen years to build a hotel. Fourteen years wasting iron bars, sand, stone, cement, rubber, fuel, manpower before the country made a single penny from the hotel being used. Eleven years to finish our hospital here in Pinar del Río! It’s true that in the end it was finished and it was finished well, but things of this sort should never happen again. The minibrigades, which were destroyed for the sake of such mechanisms, are now rising again from their ashes like a phoenix and demonstrating the significance of that mass movement the significance of that revolutionary path of solving the problems that the theoreticians, technocrats, those who do not believe in man, and who believe in two-bit capitalism had stopped and dismantled. This was how they were leading us into critical situations.In the capital, where the minibrigades emerged, it pains us to think that over fifteen years ago we had found an excellent solution to such a vital problem, and yet they were destroyed in their peak moment. And so we didn’t even have the manpower to building housing in the capital; and the problems kept piling up, tens of thousands of homes were propped up and were in danger of collapsing and killing people. Now the minibrigades have been reborn and there are more than 20,000 minibrigades members in the capital. They’re not in the contradiction with the nag, with the Economic Management and the Planning System, simple because the factory or workplace that sends them to the construction site pays them, but the state reimburses the factory or workplace for the salary of the minibrigades member. The difference is that whereas the worker would normally work five or six hours, on the minibrigades he works ten, eleven or twelve hours doing the job of two or three men, and the enterprise saves money. Our two-bit capitalist can’t say his enterprise is being ruined. On the contrary, he can say, “They’re helping the enterprise. I’m doing the job with thirty, forty or fifty less men and spending less on wages.” He can say, “I’m going to be profitable or at least lose less money; I’ll distribute more prizes and bonuses since wage expenditures will be cut down.” He organizes production better, he gets housing for his workers, who in turn are happier because they have new housing. He builds community projects such as special schools, polyclinics, day-care centers for the children of working women, for the family; in short, some many extremely useful things we are doing now and the state is building them without spending an additional cent in wages. That really is miraculous! We could ask the two-bit capitalists and profiteers who have blind faith in the mechanisms and categories of capitalism: Could you achieve such a miracle? Could you manage to build 20,000 housing units in the capital without spending a cent more on wages? Could you build fifty day-care centers in a year without spending a cent more on wages, when only five had been included in the five-year plan and they weren’t even built, and 19,5000 mothers were waiting to get their children a place, which never materialized. At that rate, it would take 100 years! By then they would be dead, and fortunately so would all the technocrats, two-bit capitalists, and bureaucrats who obstruct the building of socialism. They would have died without ever seeing day-care center number 100. Workers in the capital will have their 100 day-care centers in two years, and workers all over the country will have the 300 or so they need in three years. That will bring enrollment to 70,000 or 80,000 easily, without paying out an additional cent in wages or adding workers, because at that rate with overstaffing everywhere, we would have ended up bring workers in from Jamaica, Haiti, some Caribbean island, or some other place in the world. That was where we were heading.It can be seen in the capital today that one in eight workers can be mobilized, I’m sure. This is not necessary because there would not be enough materials to give tasks to 100,000 people working Havana, each one doing the work of three. We’re seeing impressive examples of feats of work, and this achieved by mass methods, by revolutionary methods, by communist methods, combining the interests of people in need with the interests of factories and those of society as a whole. I don’t want to become the judge of different theories, although I know what things I believe in and what things I don’t and can’t believe in. These questions are discussed frequently in the world today. And I only ask modestly, during the problem of rectification, during this process of this struggle — in which we’re going to continue as we already explained: with the old nag, while it can still walk, if it walks, and until we can cast it aside and replace it with a better horse as I think that nothing is good if it’s done in a hurry, without analysis and deep thought — What I ask for modestly at this twentieth anniversary is that Che’s economic thought be made known; that it be known here, in Latin America, in the world; in the developed capitalist world, in the Third World, and in the socialist world. Let it be known there too! In the same way that we may read many texts, of all varieties, and many manuals, Che’s economic thought should be known in the socialist camp. Let it be known! I don’t say they have to adopt it; we don’t have to get involved in that. Everyone must adopt the thought, the theory the thesis they consider most appropriate, that which best suits them, as judged by each country. I absolutely respect the right of every country to apply the method or systems it considers appropriate; I respect it completely! I simply ask that in a cultured country, in a cultured world, in a world where ideas are discussed, Che’s economic theories should be made known I especially ask that our students of economics, of whom we have many and who read all kinds of pamphlets, manuals, theories abut capitalist categories and capitalist laws, also begin to study Che’s economic thought, so as to enrich their knowledge. It would be a sign of ignorance to believe there is only way of doing things arising from the concrete experience of a specific time and specific historical circumstances. What I ask for, what I limit myself to asking for, is a little more knowledge, consisting of knowing about other points-of-view, points-of-view as respected, as deserving and as coherent as Che’s points-of-view. I can’t conceive that our future economists, that our future generations will act, live and develop like another species of little animal, in the case like the mule, who has those blinders only so that he can’t see to either side; mules, furthermore, with grass and carrot dangling in front as their only motivation. No, I would like them to read, not only to intoxicate themselves with certain ideas, but also to look at other ones, analyze them, and think about them. Because if we are talking with Che and we said to him, “Look, all this has happened to us,” all those things I was talking about before, what happened to us in construction, in agriculture, in industry, what happened in the terms of goods actually produced, work quality, and all that, Che would have said, “It’s as I warned, what’s happening is exactly what I thought would happen,” because that’s simply the way it is. I want our people to be a people of ideas, of concepts. I want them to analyze those ideas, think about them, and if they want, discuss them. I consider these things to be essential. It might be that some of Che’s ideas are closely linked to the initial stages of revolution, for example his belief that when a quota was surpassed, the wages received should not go above that received by those on the scale immediately above. What Che wanted was for the worker to study, and he associated his concept with the idea that our people who in those days had very poor education and little technical expertise should study. Today our people are much better educated, more cultured. We could discuss whether now they should earn as much as the next level or more. We could discuss questions associated with our reality of a far more educated people, a people far better prepared technically, although we must never give up the idea of constantly improving ourselves technically. But many of Che’s ideas are absolutely relevant today, ideas without which I am convinced communism cannot be built, like the idea that man should not be corrupted; that man should never be alienated; the idea that without consciousness, simply producing wealth, socialism as a superior society could not be built, and communism could never be built. 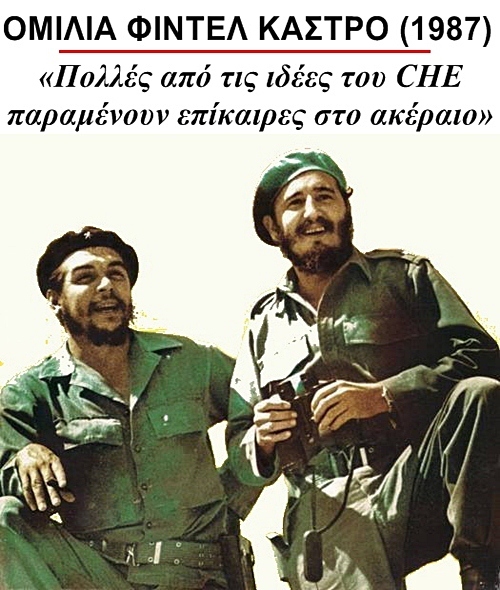 I think that many of Che’s ideas — many of his ideas! — have great relevance today. Had we known, had we learned about Che’s economic thought we’d be a hundred times more alert, including in riding the horse, and whenever the horse wanted to turn left of right, wherever it wanted to turn — although, mind you, here this was without a doubt a right-wing horse — we should have pulled it up hard and got it back on track, and whenever it refused to move, used the spurs hard. I think a rider, that is to say, an economist, that is to say, a party cadre, armed with Che’s ideas would be better equipped to lead the horse along the right track. Just being familiar with Che’s thought, just knowing his ideas would enable him to say, “I’m doing badly here, I’m doing badly there, that’s a consequence of this, that, or the other,” provided that the system and mechanisms for building socialism and communism are really being developed and improved on.